WEYMOUTH, U.K. -- Two seals in the United Kingdom are keeping their long-distance love alive with the help of FaceTime. Sija and Babyface are two common seals who were separated after seven years of living together, but have reconnected thanks to their iPads, according to ABC News. Both seals lived in the Cornish Seal Sanctuary and gave birth to two baby seal pups, despite the fact that Sija was taking contraception and Babyface was thought to be too old to breed. Officials decided to split the couple up after Sija's second pregnancy to prevent any future litters. Sija now lives in a female-only enclosure in the Weymouth SEA LIFE Adventure Park, 160 miles away, and is reportedly "thriving and happy" in her new home. Still, zookeepers wondered if she missed her old mate, so they set up iPads to allow the seals to "see" each other through FaceTime. 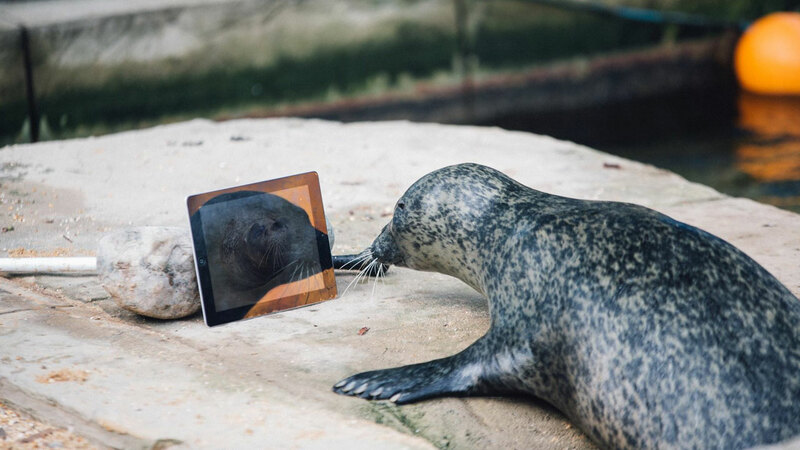 "At first the seals were both unsure about approaching the iPad, but once they saw each other they nosed up to it which was really nice to see," Weymouth SEA LIFE Displays Curator Fiona Smith said. "It's definitely the most high tech enclosure we have at Weymouth SEA LIFE so we're really pleased that SealTime is a success!"